Aspirin is a very popular drug that is used as a pain killer, anti-inflammatory, and even in managing heart disease through its blood thinning properties. Now, evidence suggests that it can also be used to treat and manage colon cancer. A study by the Harvard Medical School and Massachusetts General Hospital has shown that colon cancer patients who took 325 milligrams (mg) of aspirin twice a week lowered the risk of dying from colon cancer by 30% compard to those who did not take aspirin. Patients who were part of the test had an average of eleven years after the cancer has been detected. Doctors believe that aspirin works in treating colon cancer by blocking an enzyme called COX-2 which is expressed in the cancer tumor. 66% of colorectal cancer produces the COX-2 enzyme. A long term study by the same group also has shown that for men who have had at least 6 years of regular aspirin use helped in the prevention of colon cancer. 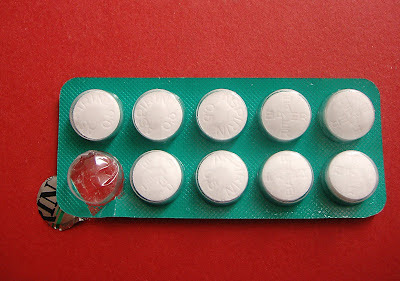 Aspirin use for maximum effect was fourteen pills a week or two pills a day. Doctors warn that despite the positive effects of aspirin, it also comes with risk. Apsirin can cause bleeding in the stomach, intestines and in the brain. Patients who are considering aspirin as part of their therapy or diet should first consult a doctor. Aspirin, the everyday drug taken by countless people around the world to ward off pain and reduce their risk of developing heart disease, may have a new trick up its sleeve –-preventing cancer. A growing body of evidence suggests that taking aspirin may reduce an individual's chances of developing colorectal cancer and perhaps other malignancies, but whether that evidence is strong enough to outweigh the risks of prescribing it to millions of healthy people is the subject of debate. At the European Society for Medical Oncology (ESMO) 2012 Congress in Vienna, both sides of that debate are being aired in front of an audience of experts in one of the meeting's popular Controversy sessions. Arguing in favor of the question – "Is aspirin (NSAID) ready for chemoprevention of colorectal adenoma/cancer?" – is Prof Robert Benamouzig from the Department of Gastroenterology, Avicenne Hospital, Bobigny, France. "The efficacy of aspirin in preventing colorectal cancer has been made obvious by more than twenty years of research," said Prof Benamouzig. "In 2010, researchers published the 20-year follow-up of five pooled randomized trials that assessed the effect of aspirin on colorectal cancer incidence and mortality. The study of more than 14,000 patients found that daily aspirin at any dose reduced risk of colorectal cancer by 24% and associated deaths by 35% after a delay of about 8 to 10 years." "In these trials, the reduction of colorectal cancer rates was in essence a side-effect of treatment. None of them had such a reduction as their primary outcome. Nevertheless, the evidence that aspirin is effective for preventing these colorectal cancers is very strong," Prof Benamouzig said. Arguing that the answer to the question should be "No" is Prof Nadir Arber, Director of the Integrated Cancer Prevention at the Tel Aviv Sourasky Medical Center in Israel. "NSAIDs and in particular aspirin are very promising in secondary prevention of colorectal neoplasia, however their role in primary prevention is still not proven," Prof Arber said. "This means that the majority of the population does not need, and is not going to benefit from aspirin use. Having said that, specific high-risk populations definitely can benefit from aspirin intake, including people with hereditary non-polyposis colorectal cancer, familial adenomatous polyposis, existing colorectal cancer or adenoma. In the future based on genomic profile, we would be able to identify people who are at high risk of developing colorectal cancers and who might benefit from aspirin therapy." During the discussion, Prof Arber will present preliminary data showing how the efficacy and toxicity of aspirin in preventing cancer can be predicted based on some single nucleotide polymorphisms. Before aspirin can be used for preventing these cancers, we need to develop means of identifying people who are going to benefit from the drug without developing side-effects, Prof Arber said. Risks of taking aspirin include gastrointestinal bleeding and intracranial hemorrhage. "We need a study that will measure overall morbidity and mortality and not efficacy and toxicity in a single organ or disease such as cardio-vascular disease," he said. How soon will colorectal patient management be driven by molecular factors? Deep DNA sequencing of tumor: ready for prime-time or not? Are EGFR inhibitors the best choice for the first line treatment of EGFR mutated lung adenocarcinoma patients? Can neo-adjuvant breast cancer data be used to accelerate drug approval? Is thromboprophylaxis mandatory in the management of patients with advanced cancer?